The Internet is a wondrous thing. Before the Internet and blogging I had never heard of a pie named after a, er, not-so-pretty insect. Pastries and delicacies on the Continent are named after prettier things. 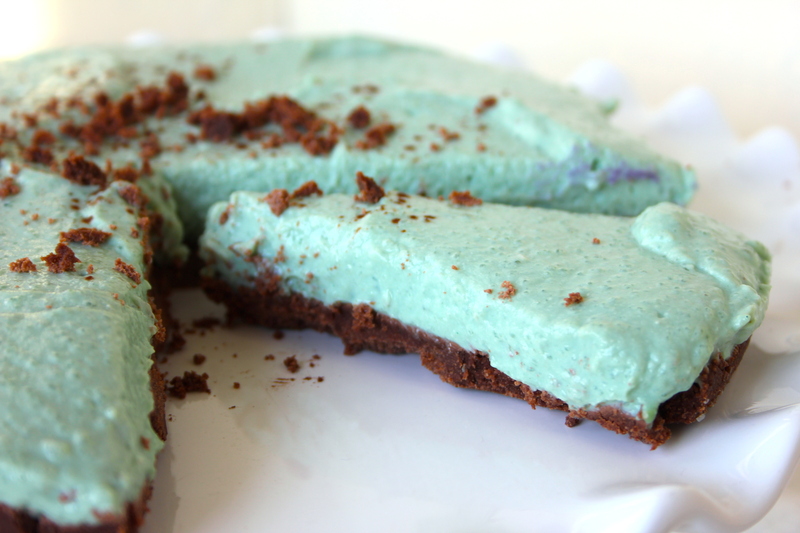 But it sounded interested – after all, it is made primarily with chocolate biscuits and a thick, gloomy mint cream. It sounded like something I would enjoy. 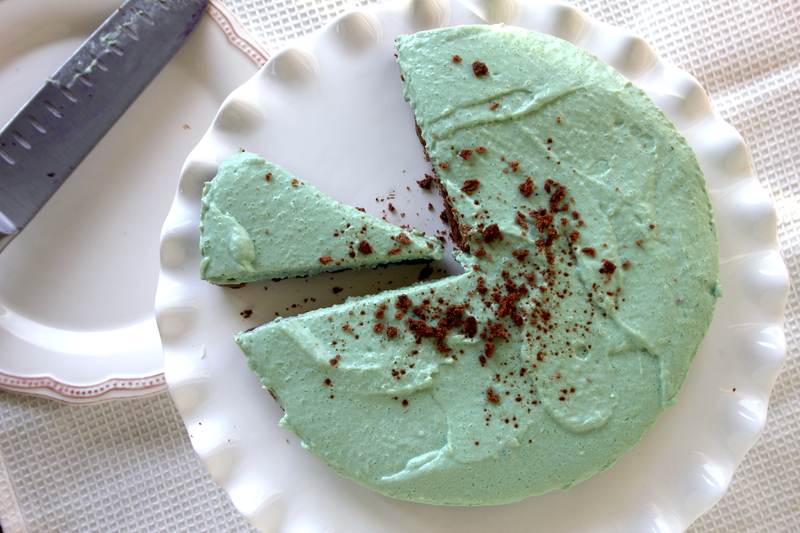 So I did some research and it turns out Grasshopper Pie is made out of pretty much sugar, heavy cream, more sugar, and then some… Hm, no thanks. But I was still hungry for pie. 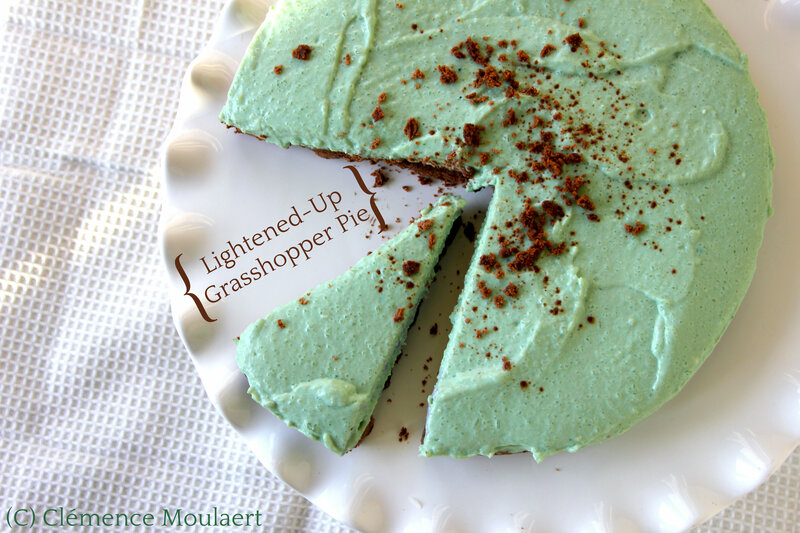 Now finally I have made and tried Grasshopper Pie – a lightened-up, cruelty-free kind that has not disappointed my eager tastebuds. The tofu replicates the fluffy texture of the melted marshmallows and instead of liqueur I have used peppermint oil – although if I’d had some liqueur on hand, I probably would have used that instead. Not saying it’s 100% healthy because the base is still made with chocolate cream biscuits, but it should be lighter on your digestive system than the original stuff. Not to mention it is kinder for the planet and all its living creatures, too. Go eat some pie, you goodie-two-shoes-eco-hipster-tree-hugger. Pulse the chocolate and biscuits to a fine powder in a food processor or high-speed blender, then transfer to a bowl and add the coconut oil. Press this dough into a lined and greased springform cake tin, using your hands. Set aside in the fridge so the base can firm up. Blend all the ingredients in a high-speed blender or food processor until smooth. Pour into the cake tin, over the chocolate base, and smooth over the top with a spatula or spoon. Leave to set in the fridge for a minimum of 2 hours, but preferably 4.